PHOTO CAPTIONS: 1-2. The happy couple, 3-4. 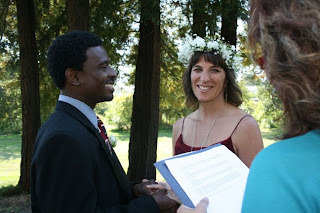 Vows and rings, 5. Seal it with a kiss, 6. 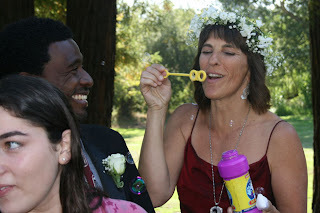 Bride blowing bubbles, 7. 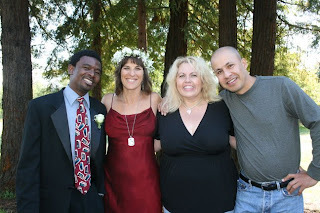 (L-R) Andre, Chelsea, Debbie, Daniel, 8. 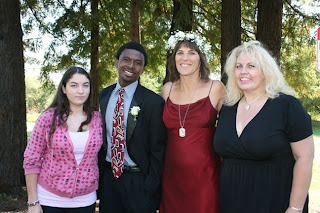 (L-R) Christine, Andre, Chelsea, Debbie, 9. 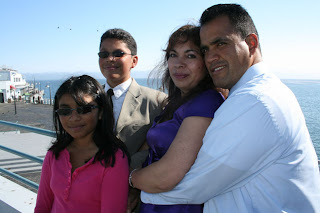 Moises, Lety and their kids, 10. Our photographer Gabriel, 11. 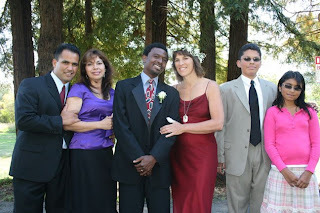 (L-R) Debbie, Daniel, Lety, Christine, Andre, Chelsea, Moises, Janette, Erik, 12. 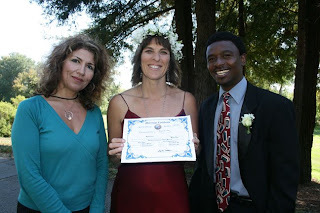 County employee Anita performed our marriage ceremony, 13-14. On the wharf. 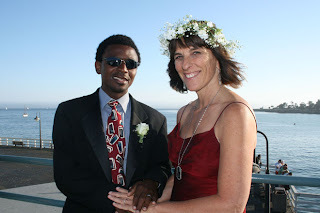 Since it's 2:30 a.m., I'll just write a quick recap of our wedding day. Actually, it came close to being a perfect event. Everyone met on time at the county building. 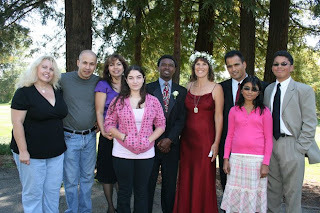 Our official Anita took us outside to the lawn beside the redwood trees to do the ceremony. 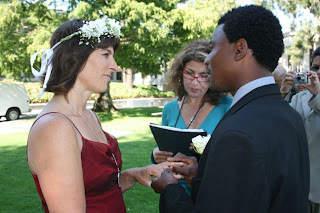 With Gabriel shooting lots of beautiful photographs, Andre and I exchanged vows. 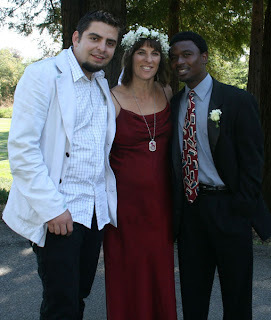 We mostly stuck to tradition, although I added a few lines about how Maya will always be part of our union, especially since she's the one who brought Andre and me together. I wore a medallion of her image and carried some of her ashes in my purse. Then we all headed down to the wharf and enjoyed Mexican seafood at Las Olitas Restaurant. 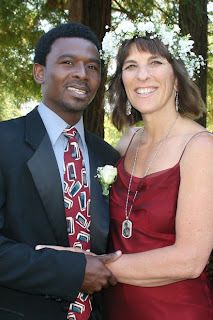 Debbie surprised us with a small chocolate and vanilla wedding cake, topped by a black groom and brunette bride. Moises and his family had to take off after dinner, but the rest of us hit the Boardwalk and headed straight for the Giant Dipper. Andre had never been on a roller coaster before, so that made it even more exciting. Gabriel got some great action shots! We ended the evening with a sunset photo session down at Natural Bridges State Beach, a special place where we ride bikes to often. A perfect end to a perfect day. 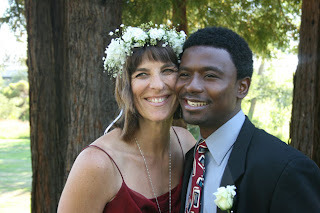 May the two of you have the very best of times together and love and hold eachother close!!! Every night. Oh yeah!! Thats the fun part!!! Lots of wet kisses !!! Come see us in Maui!! !